There are a number of folks currently taking part in ‘Plastic Free July’ – a challenge to reject single use plastics for a month. You can read about how people are getting on on various blogs, but the one I am particularly following is Westywrites. 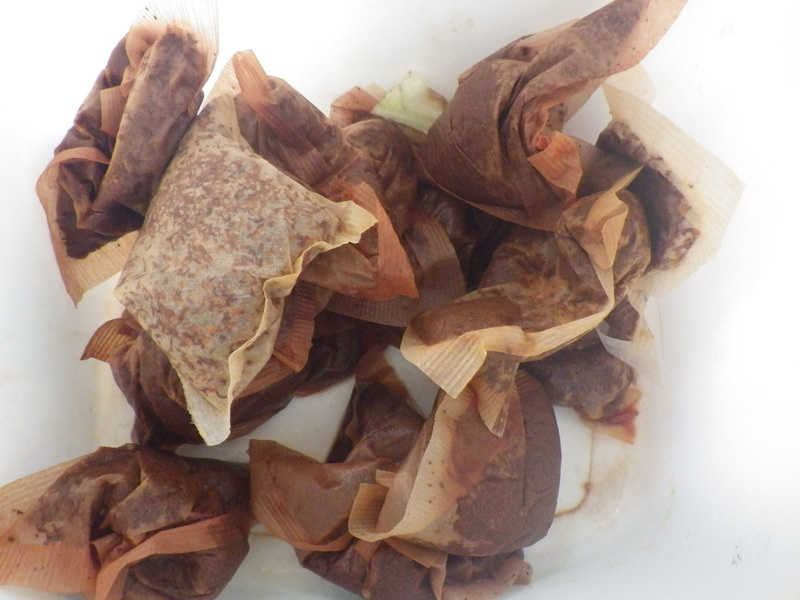 And it was through her blog that I discovered my teabags have plastic in them – and yours almost certainly do too! ‘Square “pillow” bags do have a very thin layer of polypropylene plastic’. Oh, I’m so disappointed! As someone who is trying to live more sustainably, I want to eliminate as much single-use plastic from my life as possible. I love your organic tea bags, but feel that I’m going to have to revert to loose tea because of the presence of this plastic. Yes, I know it’s a small amount, but it’s still there and it all adds up. Please, please could you consider ways of making tea bags without the plastic? I know it would make you very popular with customers like me who care deeply about the environment and the products we buy. Thank you for contacting us here at Clipper – it is lovely to hear from you! With regards to your concerns about their being plastic within tea bags we can confirm that certain types of tea bags do contain polymer fibres. Standard square or round tea bags which are the most common in the UK market will all contain a type of polymer fibre as they are made using heat-sealable filter paper. The tea bag filter paper requires a means of sealing the two layers of paper together as paper will not stick to paper and glue is not used. The filter paper Clipper uses for this type of tea bag contains polypropylene to provide the heat-seal function. The filter paper is food grade for its intended purpose and meets all relevant UK and EU Regulations. The filter paper used to produce tea bags with the string and tag attached does not need to be heat-sealable, as it is closed differently, and therefore does not contain any polymer fibres/plastic content. In terms of Clipper packaging in general we can confirm that we do not use PLA material (the biodegradable material used for some pyramid bags and other plastic packaging) as it is derived from corn which may be from GM sources. Is it time to ditch the bags? Well, it’s disappointing, but at least they responded. However, perhaps if lots of people wrote to them (and other companies that make teabags) they might start to take notice. So, I’d like to ask you to write a single e-mail, letter or tweet to the company who make your teabags and ask them whether they use plastic in them and, if they do, to stop it! It’s surprising isn’t it? I have to say I thought I was safe with the unbleached organic ones! And now it’s getting into our compost heaps! Eeuw! Who knew? And now I’m busy patting myself on the back for using loose tea. It’s really not that hard to recycle if you use one of those metal cyclindrical infuser jobbies in the teapot. 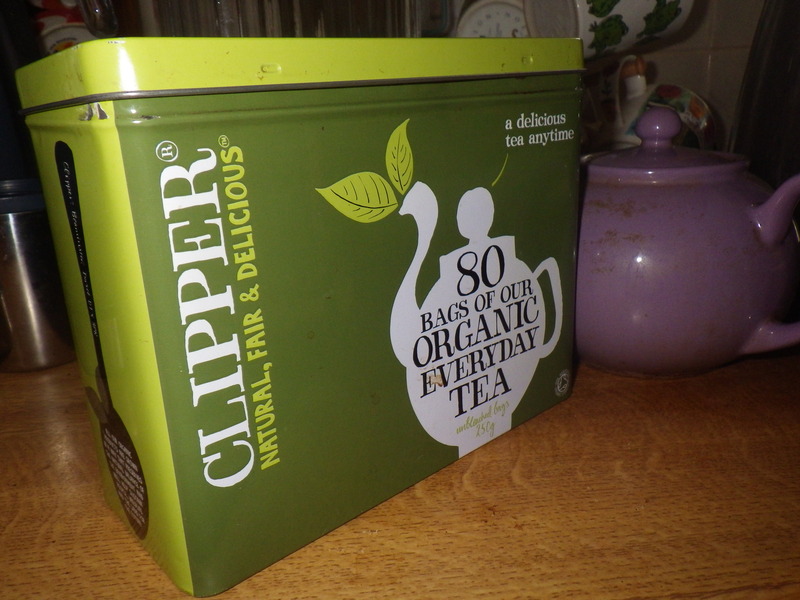 The main thing I like about leaf tea is that it’s not dust, the sweepings from the bottom of the bin. The flavour’s so much better. Good luck with your campaign! You have every right to be smug… better get my act together and purchase an infuser. I wonder what the collective noun for Kates is? Possibly a tea party judging by the responses! I don’t like the gunk, so I think a fine-mesh infuser is the way to go! I’m quite drawn to the swishing, though. However, lots of folks will continue to use bags, so I think putting pressure on the manufacturers is still a good idea. I’m really disappointed to have discovered this…. time to buy an infuser I think! Although we do have a shop locally where I can buy it completely free of packaging if I remember to take my own container. I will have to do a price comparison… I never normally buy loose tea so I have no idea. There’s civil unrest here if we don’t get our tea! We’re much less bothered about chemicals sprayed on our food, corrupt politicians and huge spending on weapons. Oh sigh! Sadly the link to the list of toothpastes that actually contain the plastic doesn’t work, but even so I’m depressed that any of them do… and here was me fretting about the pros and cons of flouride… at least they list that in the ingredients! For the time being, however, I will continue my quest for plastic-free sunflower and pumpkin seeds… I’ve run out of the ones I grew myself. Ooh, that’s surprising and very frustrating! I buy loose-leaf tea when I can, but my happy organic hippy sleepy tea comes in pillow bags, which the company says is to prevent the use of staples with strung bags, so maybe they’re plastic free? I will write to them and ask. Fine mesh strainer insert teapots are the way to go. You can easily remove the mesh when the tea is brewed to your taste and leave it for re-brew or bang it out into the compost. At work I use a tong-style infuser that just sits in the cup to brew, then I leave it drain, and again really easy to bang out the leaves and wipe clean. Much less mess than my coffee plunger! (Not going to worry about my Peruvian tea bags though. Can’t let myself think too much about what I’m eating and the waste I’m creating here as it’s all too depressing. Reminds me, better go take the recycling to the depot up the street, else the cleaning lady will bin the lot tomorrow. I think you have enough to worry about in Peru without plastic in your teabags! Great article. Thanks! I love that you wrote to the company – that’s so important. It’s exactly the kind of quest we write on http://www.worldchanging.me for everyone to do (if they choose to). Do you mind if I borrow some of the words from your letter when I write up the quest? You are welcome to use whatever parts of my letter that you like. I really hope that more people put pressure on the producers of teabags in order to drive forward change. I’m still scandalised by this tea bag thing! I use loose leaf tea, but I have some teabags for guests for tea I don’t drink. I won’t be doing that anymore! The thing with those tagged bags, they are usually wrapped in plastic on the outside! We went to China a few years ago and visited a tea house where we were told about the flavours that develop and the significance of the different cups from the pot… I just wish I could remember it all. I’m going to go look at my tea bags now! I had no idea – talk about uninformed consumer! I think that the majority of us were uninformed consumers, but let’s get word out there and ask our teabag manufacturers to make some changes! I didn’t write then – but I have now! The bags with a string and a tag still have a sealed edge – so how is that sealed I wonder? So much to think about! I think some of the ones with a string are held together with a staple. I never got an answer from Jacksons of Piccadilly, who The Guardian said made plastic-free teabags.. I suspect that means they didn’t have good news to impart. Gosh – what a subject – so many things to discover about the humble cuppa. I love the research you do. I’m going to see if Pukka use plastic and they use a folded and stapled bag, but there is one bonded seam. it really is a can of worms. I came to the conclusion that loose tea was the only answer… and herbs from the garden for the herbal varieties.